Ji Eun formed a duo KAYA with a Korean guitarist Sung Min Jeon. They have been performing together since 2002 in Korea and since 2005 in Europe after they settled in London, UK. They’ve performed for various diplomatic, corporate, cultural, educational and charity events in the UK and Europe. They were often invited to perform to represent Korea and Asia, and also stand for a harmony between the East and the West. In addition, as born-again Christians, they’ve performed for various Christian events and led worship at churches. They released their first two CDs with their own compositions, ‘Bridge’ and ‘Korean Breeze’, in 2010 in the UK. 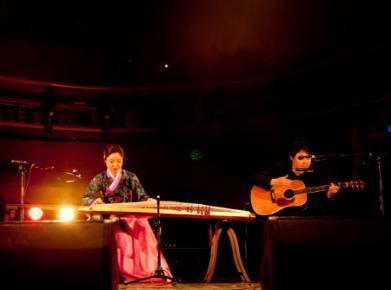 Their repertoire includes not only Korean traditional pieces and their own compositions but also various modern and Western pieces such as classical, film and pop music.